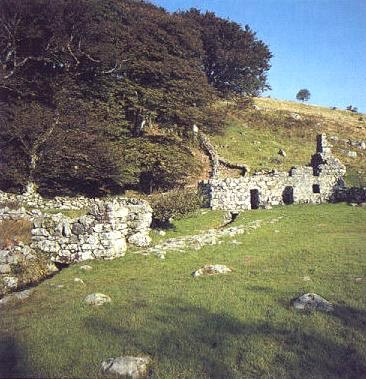 St Cybi's Well is situated in an enchanting valley just below and to the north of Llangybi Church. It is approached by crossing a stile at the east end of the churchyard and then following a path to the far corner, across another stile, and down the side of a field into the valley. The well is one of the most elaborate structures of its kind in this area of north Wales, consisting of two well chambers, a cottage for a custodian and a small detached latrine building. The main approach is across a stone causeway on the eastern side of a low-lying waterlogged field. Another shorter causeway can be seen running from the well to the ruined remains of the latrine building. The main well chamber (below right) is built of large blocks of stone which have the external appearance of being dry-built, but which are mortared on their inner face. The two western corners (to the left) of the chamber are chamfered in all but their lowest courses and there was a similar chamfer at the north-eastern corner (back right), where the chamber is now joined to the cottage. No evidence survives to show whether the south-eastern corner was also chamfered, but the use of two very large blocks of stone to the left of the cottage doorway may point to some rebuilding in this corner. The well is traditionally associated with St Cybi who is reputed to have settled in this part of Wales sometime around the middle of the sixth century A.D. Cybi is one of a group of Welsh saints whose Lives are to be found in a manuscript dating to this period. According to the Life, Cybi was born in Cornwall. He had travelled widely, particularly in the Irish Sea area, before, as a result of a dispute in Ireland, he came with his disciples to north-west Wales. Upon landing on the island of Anglesey, he is supposed to have struck a rock with his staff from which water immediately flowed. 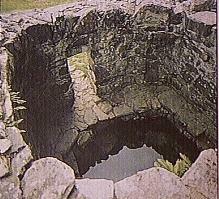 The well was a place of pilgrimage and the waters were reputed to cure warts, lameness, blindness, scrofula, scurvy and rheumatism. The well continued in use, in one form or another, after the Reformation and there was still a box Cyff Gybi, for offerings in the church as late as the 18th century. Treatment appears to have consisted of giving patients an equal quantity of well-water and sea water, morning and evening, for a period varying from seven to ten days. They then had to bathe in the water once or twice a day, retiring after each bath to a bedchamber in the adjoining cottage where they were given a quantity of healing water to drink. The success or otherwise of the treatment was judged by whether the patient became warm in bed or remained cold, with the former condition indicating that the treatment was progressing satisfactorily. The patients used to throw pennies and pieces of silver into the water after each immersion and they would sometimes take bottles and casks of the water away with them. A stone-wall Iron Age hillfort, Carn Pentyrch, lies on the hill above St Cybi's Well. The innermost ring with its thick, high stone wall may be early medieval; the other two lines consist of walls and banks and are probably prehistoric.